Molds and dies that are made of cast iron are often exposed to temperature fluctuations. Thermal fatigue often results in mold surface cracks that eventually lead to severe mold damage. 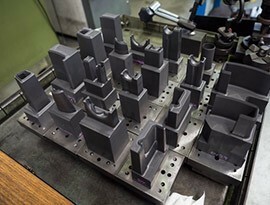 Molds and dies coatings have been one of our service fortes since our formative years and we are highly committed to extending the lifespan of molds and dies, thereby reducing maintenance costs and increasing operational efficiency for your business. A&A Coatings is able to provide superior repair and maintenance solutions so that molds and dies commonly used in your business can be kept in a working condition for as long as possible. We use both flame-sprayed oxidation-proof alloy powders and plasma-sprayed ceramic coatings as coating materials. As iron oxidation is the main reason why molds and dies reach their end-of-life sooner than usual, we use plasma-sprayed alumina and other ceramic coatings for protecting molds and dies from occasional wear and corrosion. Product quality and production requirements are the key drivers from continuous growth in the engineering industry and our surfacing technologies play a pivotal role in this regard. Continuous production flow requires the right tooling for protecting heavy machinery from temperature and pressure induced wear and corrosion. We use thermal spray surface modification process to restore the surface bond strength and quality of molds and dies. For continuous casting, the mold lining is important as it helps in controlling the solidification rate. Until a few years ago, electroplated nickel and chromium were widely used in the steel industry for building wear resistance in molds without impacting thermal conductivity of the molds and dies. A&A Coatings, a pioneer in the field of advanced surface technologies, uses the HVOF process to safeguard the mold lining against thermal fatigue. In some cases, we also use the plasma and combustion processes for applying wear coatings on mold/dies, and self-fluxing alloys and cermets for special circumstances. A&A Coatings has built its distinctive identity in the thermal spraying service sector through precision engineering, constant research and innovation and definitive cost advantages that it offers to its clients across different industries. To know more about our specialized coating and spraying solution for molds and dies, do give us a call or email us today.